(Nov. 16, 2010) — The Post & Email has decided that it will no longer allow the corrupt Hawaii Elections Office and Office of Information Practices to stonewall our request for Nomination Certificates from the RNC, DNC, and Hawaii state Democrat and Republican parties for 2008, 2004 and 2000 which we requested in July. These documents have been released to other parties and widely posted on the internet, leading some to the conclusion that the Hawaii Democrat Party violated state law and omitted the required “constitutionally-eligible” wording when the names of Barack Obama and Joe Biden were indicated as the party nominees for president and vice president, respectively. You have failed to respond to my October 22, 2010 letter regarding the Nomination Certificates which I originally requested from the Elections Office on July 27, 2010. Since their excuse was that they were busy with the “election cycle” and the elections are now concluded, why have they not acceded to my request? And why have you not enforced your own state law which you mentioned in your letter to them? As an officer of the court, are you not obligated to enforce the UIPA law? Is there any reason why the Elections Office cannot release these documents with proper payment from me, which I have offered on several occasions to remit? I am no longer asking, but rather demanding, an answer and the documentation. We all know that the state of Hawaii has lied about Obama’s origins, so I am not going to prove anything that is not already in the public domain. However, I have a right to the Nomination Certificates which others have received previously. I will give the Elections Office ten more business days to send me the documents or I will be filing a lawsuit in Circuit Court against your office and them. Thank you for your immediate response to this letter. A copy of the letter was sent to the Hawaii Elections Office. The October 22 letter and previous correspondence to the Hawaii Elections Office and OIP are here. Are the Officials in Hawaii Nervous Yet? 26 Responses to "Last Request to Hawaii Attorney for Documents before Lawsuit is Filed"
Hi! I ran against U.S. Senator Patrick Leahy 2010 and I am running against U.S. Senator Bernie Sanders 2012. In the statewide televised U.S. Senate debate on VPT October 28, 2010, the moderator, Stewart Ledbetter (Vermont Bureau Cheif, Host of Vermont This Week on VPT and News Channel 5 Reporter for WPTZ) asks each candidate what keeps them awake at night thinking about it? I said that I am concerned that on President Obama’s birth certificate that he has allowed to be shown on the internet, that in the lower right hand corner is an HRS code, a Hawaii Revised Statute that proves that the certificate was amended and or altered. I don’t respond to his journalistic implications. Very disturbing comments indeed. Sounds like this anon commentor has lost touch with reality. Sorry you have to put up with such ridiculous stuff, and thanks for your reply and your website. I am frankly not surprised that the EO sent you documents within the time deadline you set forth in your letter. Both offices know the law is on your side, and they have basically failed to cooperate, to test you to see how far they could get by stonewalling you. We will all be very interested to see if they provided you with exactly what you asked for months ago, and if it is beneficial. Nice work Sharon. We are with you. I hope the owner of the site reports this person to the FBI,….. assuming they will take some action. The reason medical attendents are part of the list is because no hospital in Hawaii has indicated it ever admitted Stanley Ann Dunham (or Stanely Ann Obama) in August of 1961. None. Lets repeat that – no hospital or any medical facility has ever claimed to be the facility of birth for Obama. In fact, some have go out of their way to have certain statements in letters corrected to ensure they would not be improperly listed as the birth facility. Since those records are easily verified there will likely be a claim of ‘home birth’ at some point. To which an attending medical personal should have been present if it happened – i.e. a mid-wife. To make this clear – there is no credible, independent record or evidence of Obama Jr. being in the islands of Hawaii before he and his mother came back from living in Washington state after Obama Sr. left the islands for Harvard. Actually Bobby WAS born in Louisana but his parents were not. He was accepted to Harvard medical school and Yale law. he was baptized a Catholic in the Catholic rite. AND NOT ONLY THAT BUT BRET BAIER ASKED BOBBY JINDAL IF HE WAS PLANNING ON RUNNING FOR THE PRESIDENCY. I LIKE BOBBY BUT I DON’T THINK HE WAS BORN HERE EITHER AND CERTAINLY HIS PARENTS WEREN’T BORN HERE. HE IS INDIAN I BELIEVE. WHAT’S WRONG WITH THEM EVEN HANNITY ASKED JINDAL IF HE WAS RUNNING. WHAT IS UP. I DON’T THINK WE HAVE A CONSTITUTION. 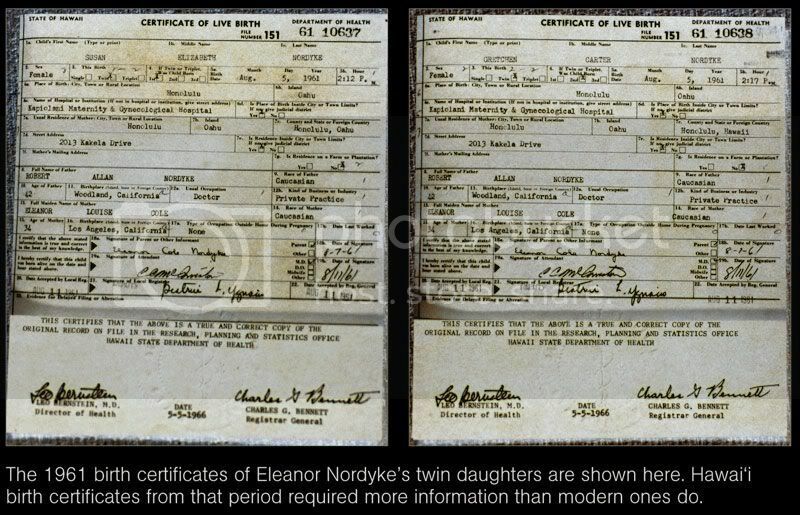 Sharon, I put the wrong link in my last post to the real Hawaii long-form birth certificate..
Would you please replace the one I placed there with this one? I think it will work…..
That is great news…….thank you again!! Why would “medical attendants” be significant? Count me in for Texas. I second that Mrs. Rondeau! Happy Holidays. Mrs. Rondeau replies: Lo and behold, I just received all the documents from the Elections Office yesterday. Article to follow. Hawaii could quickly become another Cuba. If you’re going to sue, add on the DOH for the release of records or information from the original birth records to include certificate number, all addresses registered on the birth records, names of all signees and official, specific place of birth and medical attendants. Sharon, I commend you for making a decision to make a formal demand for the records, and set a ten day deadline. That is what attorneys do, and so does the government when they want something from us. If they do not produce the records you properly requested within the deadline you set forth, please let us all know ASAP, and as for me, I will be sending a check to help with any legal action. I again urge all readers of your site to make similar donations to offset costs. We are all collectively in this together, and I trust the majority of your readers want to see if you can get the Hawaii Elections Office and the OIP to follow the clear law. If I were attorney Joesting, after the letter she sent to the EO, I would be contacting the EO and telling them to produce the documents, or look like fools in court. Thank you. Mrs. Rondeau replies: Thank you for your support. At this point, I have no choice. Are there any patriotic attorneys in Hawaii? In preparation for 2012, how about we re-examine a recent article on the P&E from a person who, at least for her state, figured out how and when to challenge (with standing) the eligibility of candidates who are placed on the ballot? If most (or maybe all?) states have such a process, we could coordinate a nationwide effort to challenge Obama’s eligibility on state ballots across the nation. Such an effort could result in Obama choosing not to run. Mrs. Rondeau replies: Yes, that was Chalice Jackson, aka Sharon Ann Meroni. If Illinois has such a time period wherein a registered voter can challenge a candidate’s eligibility and get them to show a birth certificate as she did, then all of us must study our own states’ laws and get involved early in the process. During that special time frame, they have to check into the person’s constitutional qualifications if that is the basis for the challenge. I am not a Hawaiian, but I have heard from a few who favor restoring the Kingdom of Hawaii. They have enlightened me on much of the history behind how Hawaii became a territory of the US, following the toppling of the Hawaiian Monarchy. Mrs. Rondeau replies: Well, they certainly act like it, with so much government all over the place there. They seem to want government control of their lives and a dictator born in a foreign country to rule over them, so let them secede. That would be one less corrupt state we would have to clean up. I’m convinced they would gladly poke us in the eye any cnance they get. Any Hawaiians on board here care to dispute that? Well, Rangel is a good beginning. We shall see how far the Congress wants to go now in cleaning itself up. Thank you Sharon. It infuriates me that the media discusses Obama running in 2012 and never mentions his ineligibility. They treat it as if it doesn’t exist, and I suppose just hope it will go away………you and others like you will not let that happen…….thank you again. Hawaii should be stripped of statehood for sedition. It never should have been granted statehood in the first place, since it is NOT UNITED to the so-called “United States” by geography or culture. Bottom line to Hawaii and diverse other aliens: Don’t mess with our Constitution! God be with you in your pursuit of truth. I deeply admire your tenacity and painstaking thoroughness. Sharon, your role in the soon-to-be unmasking of the ineligibility of barack soetoro to be POTUS will be notable…….more than it seems possible at this current stage I’ll wager. They are without defense. Mrs. Rondeau replies: I wish no recognition, only for the corruption in the courts, U.S. Congress, state legislatures, county and local governments be cleaned up and for us to be free people as we were in 1776.